The Holidays Aren’t Here Yet, Stay Focused! 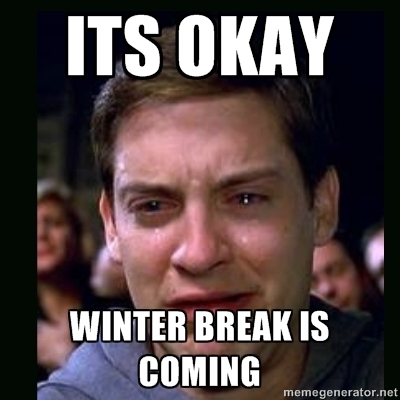 When winter break is right around the corner, it is often hard to stay focused at school. As the holidays approach it seems that stress levels increase dramatically. It is really difficult to adjust from spending time at home and trying to get back into the groove of things at school. You may be feeling like you want to skip finals altogether and pack up to go right back home (or at least I do!). – Prioritize: make a “to-do” list of work and tasks that need to be completed before the big break. – Plan: figure out what topics you need to focus on for each study day, or “free” day, your college gives you. – Stock Up: make sure to buy note cards and highlighters for those long days and nights in the library. Don’t forget to also purchase some study snacks that are high in protein and fiber. – Study Buddies: ask classmates or friends if they would want to be a part of a study group and create a study guide together. – Decorate: help realize some finals week stress by decorating your dorm, apartment or house for the holidays. It can’t hurt! – Write It Down: Write reminders for yourself in your planner or on post-its, otherwise they may get lost in the shuffle. How do you stay focused with the holidays right around the corner?